We like recipes that buck tradition, so we paired up with KIND and Elizabeth Stark of Brooklyn Supper to share a fall salad that does just that. Salad, with all its toppings, accommodates an array of ingredients to a degree few dishes can match. We all know the elements that make a salad great—tangy, salty, sweet, crunchy, chewy, creamy. 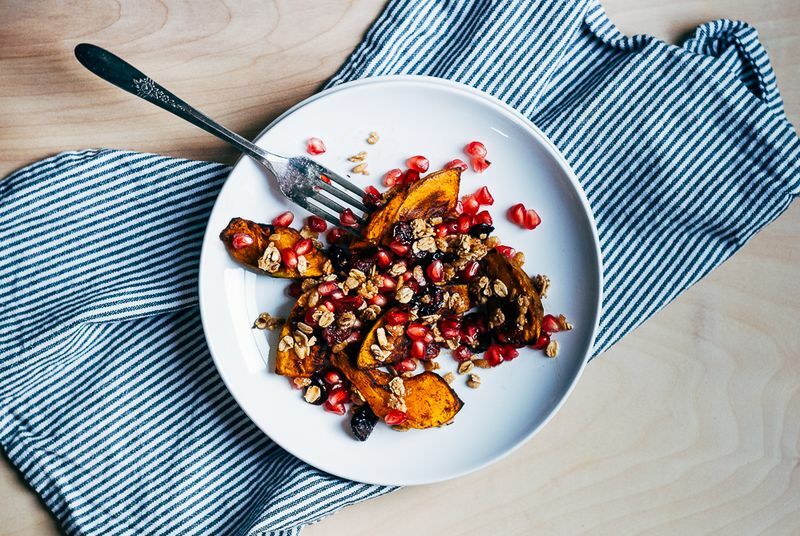 Sometimes though, it's nice to break with tradition, cast off the things we think we know about salad—add an unexpected element (granola) or go a little overboard with jewels like pomegranate arils and dried cranberries (or, in this case, both). This salad began in familiar territory, with a big green buttercup squash. Buttercups are similar to butternut, though the texture has a bit more heft—it stands up to a stint in the oven nicely. While not quite crispy, roasted squash is at its best when it has a caramelized, smoky exterior and a pillowy sweet interior, here made all the more delicious with a dusting of paprika and cinnamon. More: Can't find buttercup? 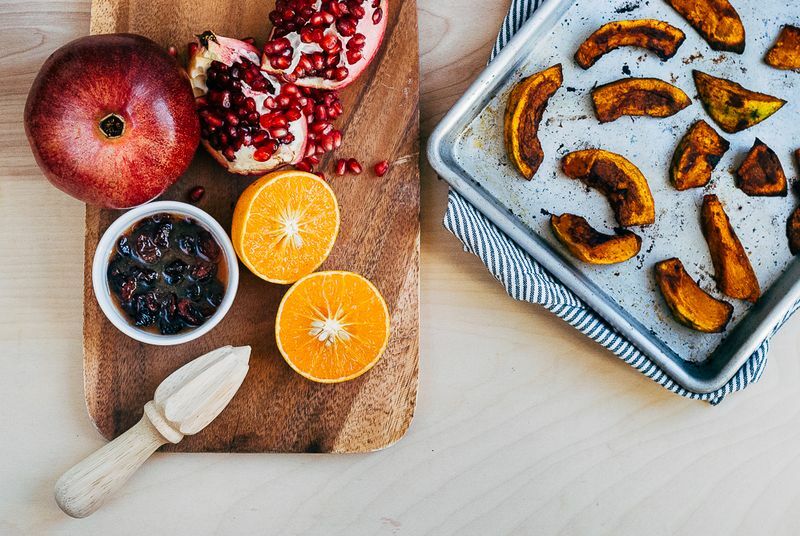 Here's how to roast any squash. To best highlight the roasted buttercup, I set about pulling in contrasts. I combined orange juice-soaked dried cranberries and almost too many pomegranate arils with the warm squash. I repurposed the cranberry soaking liquid for a strikingly simple dressing of orange juice, olive oil, and sea salt. Just before serving, I tossed the warm salad with a drizzle of dressing and topped it off with a few handfuls of spiced oat clusters. They're a delight just on their own, but on the salad, fragrant cinnamon lent a playful, satisfying crunch to every bite. We paired up with KIND and Elizabeth Stark of Brooklyn Supper to share a fall salad that bucks tradition. Sounds good. 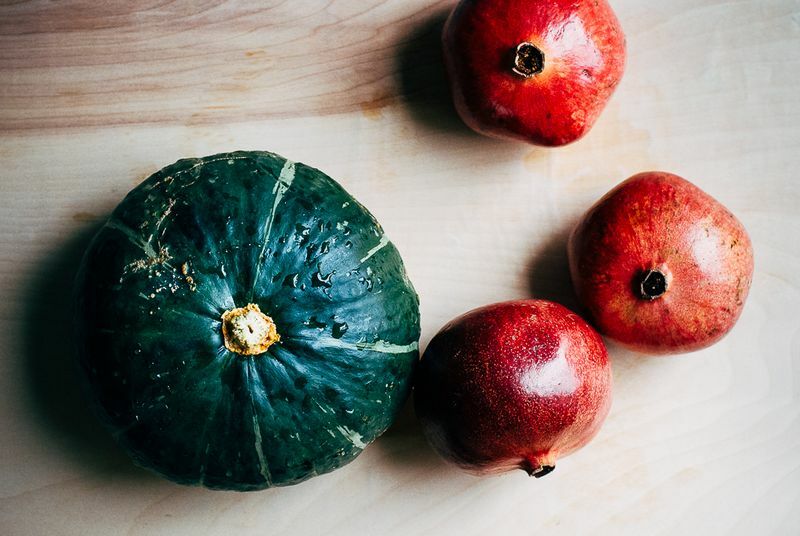 The squash you have pictured looks like a kabocha squash. They look similar. I believe kabochas are more spherical while buttercups are a bit flat and look more like a curling stone. I think they are often mislabelled/misidentified. You lost me with oat clusters. Yes sounds too sweet to me with the sweet fruit, orange juice and sweet caramelized squash. I would sub in something more savory like walnuts (for the oat clusters) and a little splash of balsamic. Glad to hear it, Bee! This sounds yummy! I have an allergy to cranberries (I know!). Do you think that dried cherries would work with the salad as an alternative? Dried cherries (especially very tart ones) are an excellent substitution!